I suppose it was inevitable that my current family business would address the traditional family business at some point: the Rainer Regiment. Austria-Hungary’s 59th “Erzherzog Rainer” Infantry Regiment, one of the old “house regiments” dating to the foundation of the Austrian professional army in 1682, would be named “the bravest of the brave” by Kaiser Franz Josef after the Battle of Solferino in 1859. At least someone from every generation of my family has served in the Rainer Regiment, some died under its colors, some became heroes, some probably were not. When the newly-organized Imperial and Royal Army formed permanent divisions in 1868, the 59th Regiment was assigned to the new 3rd Infantry Division. In the 1870’s, when War Minister Franz Baron Kuhn introduced specialized mountain warfare training, the 3rd Infantry Division became a mountain unit. Headquartered in Linz, the division saw limited action during the Bosnian Insurrection in 1878 but otherwise had little combat history when the Great War erupted in the summer of 1914. The “Edelweiss Division” followed the same infantry-heavy structure as the other 31 divisions of the Common Army: four infantry regiments, each of four battalions, each of four rifle companies. In keeping with a thousand years of Austrian military practice, things varied somewhat from the official table of organization. Like most divisions the Edelweiss Division had two brigades, each of two regiments. The 5th Infantry Brigade included all four active battalions of the 59th Infantry Regiment and three battalions of the 28th “Viktor Emanuel” Infantry Regiment, a Czech unit recruited in and around Prague. 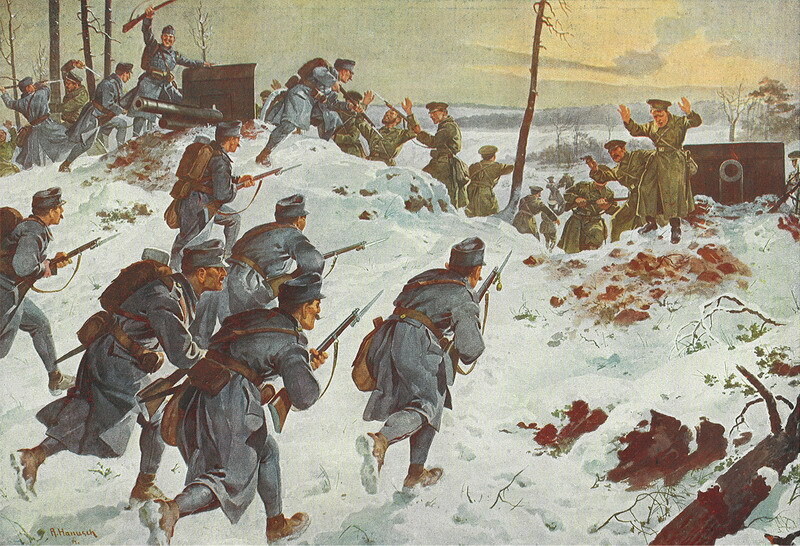 The 59th had a reputation as one of the army’s best regiments; the 28th, not so much: the regiment would be accused of mass desertion in 1915. The 15th Infantry Brigade had the usual eight battalions: four from the 14th “Grand Duke of Hessen” Infantry Regiment, a crack unit from Linz, and four more of the 2nd Kaiserjäger, the elite Tirolean riflemen. Rounding out the division, the 3rd Field Artillery Brigade had seven batteries (all light artillery, two of them with mountain guns). Two squadrons from the 6th Landwehr Uhlan Regiment, based in Wels near Salzburg, provided reconnaissance and screening. These were regulars, not reservists, part of the Austrian half of the Dual Monarchy’s army (Austrian militia were referred to as “Landsturm”). My great-grandfather rode with this regiment during peacetime, but was transferred to a Hussar unit during the summer mobilization. 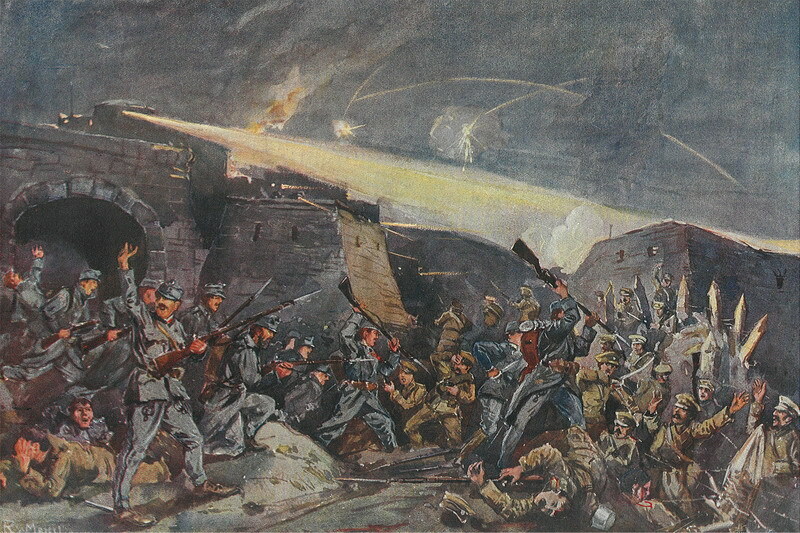 The Edelweiss Division marched into Poland in August 1914, taking part in many battles with the Russians including the great victory at Komarow, but suffered enormous casualties in doing so. Austrian success in the initial encounters with the Russians proved far worse for the Empire in the long run than a few early defeats, as those ultimately hollow victories only encouraged the high command into even more foolish ventures. With the Italian declaration of war on Austria in May 1915, mountain units like the Edelweiss Division moved to the Alpine front. 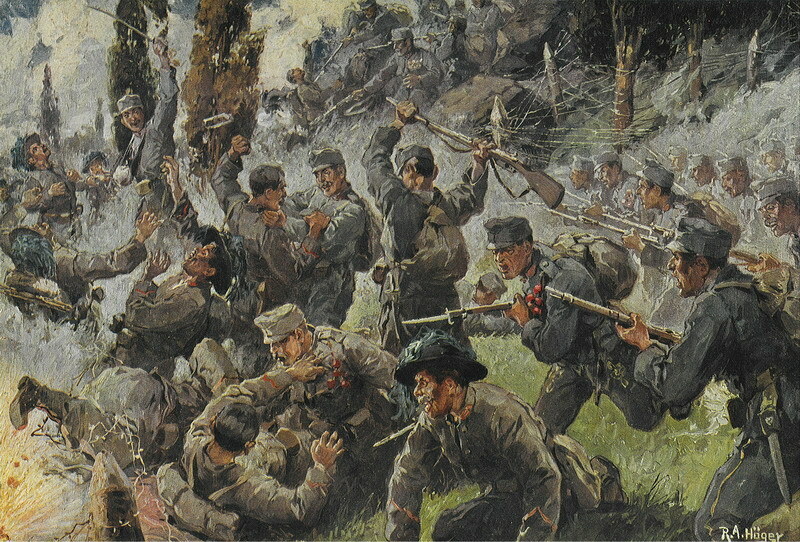 The division remained there for the rest of the war, participating in the bitter battles in the Col di Lana, on Monte Grappa and of course Caporetto. By 1917, the regiments had been reduced to three battalions each, with the extras (plus the regimental training battalion, brought to active-duty status and replaced at home by a new training organization) used to form new regiments. Two of these new regiments joined the Edelweiss Division, mostly made up of the surplus battalions of the 14th and 59th regiments. The 28th Infantry Regiment was disbanded following the accusations of mass cowardice, but later re-instated and assigned to the 28th Infantry Division. The 2nd Kaiserjäger Regiment went to the 8th “Kaiserjäger” Division, Austria-Hungary’s other elite mountain formation. Our Edelweiss Division expansion book shows the division in full Infantry Attacks glory, suitable for use with the upcoming Fall of Empires game. There are 88 fine die-cut, silky-smooth pieces in the Edelweiss Division’s special color scheme, with traditional Austrian white and the edelweiss symbol of Austria’s mountain troops (later adopted by the Germans). This being a formation from 1914, the bulk of the pieces are infantry: elite Jägers for the division’s three crack mountain regiments and regular infantry for the 28th Regiment. And the division gets a couple of cavalry squadrons. In 1914 the artillery is mostly armed with the 8cm M05 field gun; the medium piece is the M99 10cm howitzer. Neither is a particularly good weapon, and despite the sky-high morale of the gun crews (Austrian gunners considered themselves an elite brotherhood), they are badly outmatched by Russian artillery. A couple of batteries have the 7cm M08 mountain gun, which offers even worse performance but at least is easy to move. Things will get better: the Imperial and Royal Army re-equipped its artillery during the course of the war with excellent weaponry, an astounding feat of engineering, industry and organization. But those guns aren’t on the battlefields of 1914. There are also 20 new scenarios, plus a pair of battle games (campaign games linking scenarios together) drawn from the December 1914 Battle of Limanowa, a bloody Austro-Hungarian victory in which the Edelweiss Division played a prominent role. They draw on Fall of Empires (and only Fall of Empires) for maps and additional pieces. Don’t wait to put Edelweiss Division on your game table! Join the Gold Club and find out how to get it before anyone else!